Frontispiece (close-up). German-Austrian album (EH 88202652). 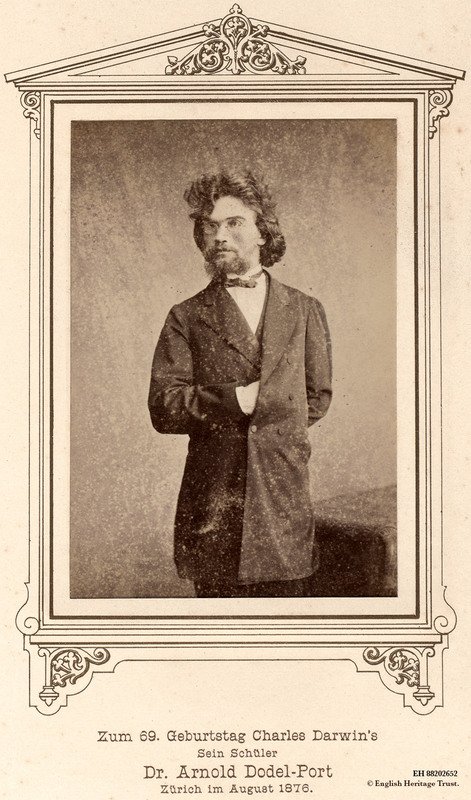 The album was sent to Darwin to mark his birthday on 12 February 1877 by the civil servant Emil Rade, and contained 165 portraits of German and Austrian scientists. The work was lavishly produced and bound in blue velvet with metal embossing. 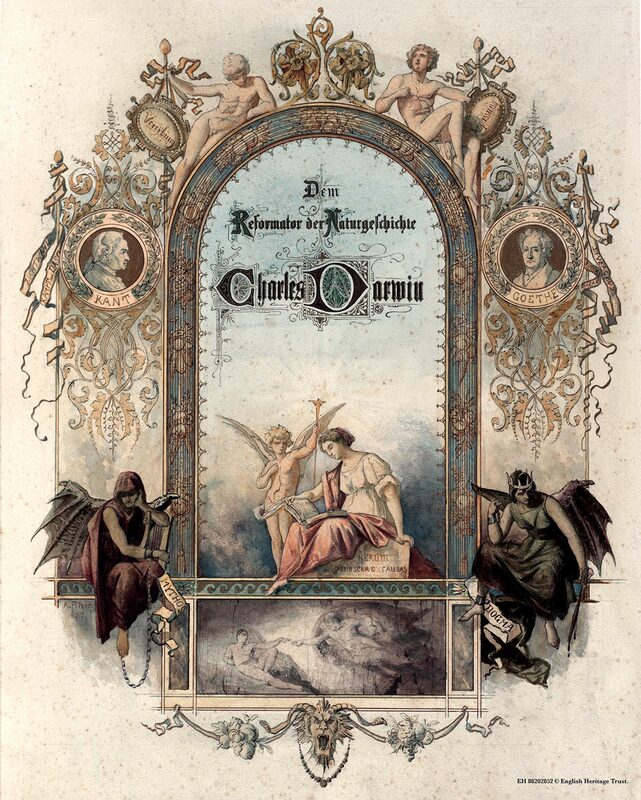 Its ornate frontispiece was designed by the painter Arthur Fitger and dedicated: ‘Dem Reformator der Naturgeschichte Charles Darwin’ (to the reformer of natural history Charles Darwin). Darwin’s age was miscalculated by the album's creators and the birthdate on the front cover is 1808 instead of 1809. The album was intended to commemorate his 69th birthday, the start of his 70th year, but Darwin was only 68 in 1877. Among the names of geologists, zoologists, physicians, and philosophers some were known personally to Darwin through correspondence. Ludwig Büchner, Ferdinand von Hochstetter, Ludwig Jeitteles, Oskar Schmidt, and Fritz Schultze had all sent Darwin their works. Carl du Prel had even tried to apply Darwinian principles to the inorganic world of stars in his book Der kampf ums dasein am himmel (The struggle for existence in the sky). Arnold Dodel-Port had sent his book based on his lectures on the theories of descent and selection. Darwin later praised the drawings in the atlas of botany aimed at universities and middle schools that Dodel-Port produced with his wife Carolina. Eduard Koch took over as Darwin's German publisher in 1867 and published a multi-volume edition of Darwin's works. Otto Zacharias had popularised Darwin's theories in the magazines he edited, and the politician and philosopher Bartholomaeus von Carneri produced works on the moral implications of Darwinism. Carl Vogt had corresponded about atavism and Wilhelm Breitenbach sent his observations on orchids and the oxslip for Darwin's work on Forms of flowers. Darwin must have been particularly delighted to see the picture of the German schoolteacher and botanist Hermann Müller in the album. 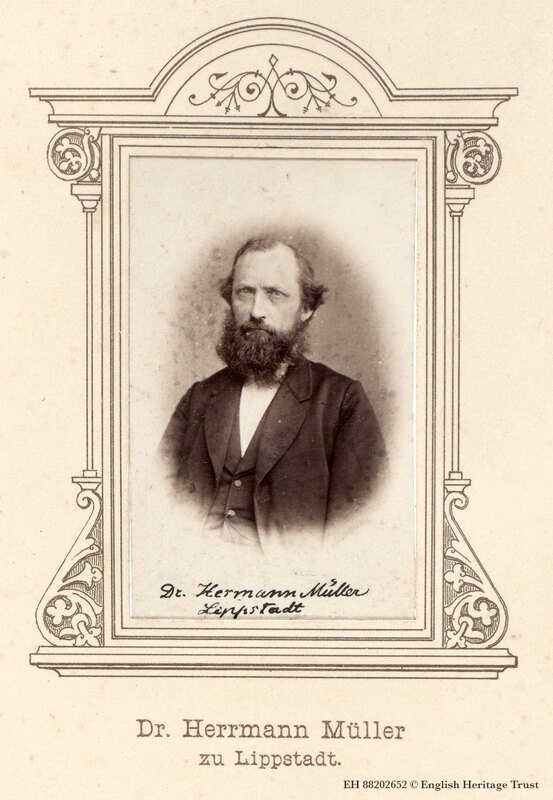 He had encouraged Müller's research on the fertilisation of flowers by insects from the mid-1860s, research that led Müller to publish important work on mutual adaptation. 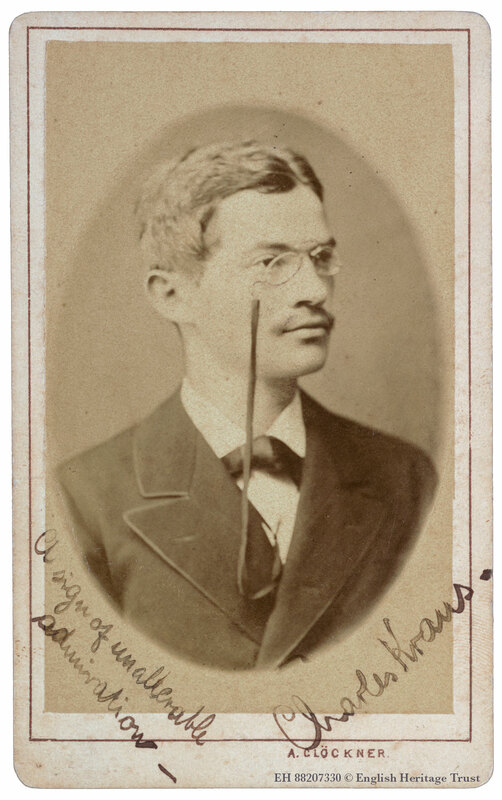 Also featured was the science writer Ernst Krause, who edited Kosmos, a German journal of natural history founded in Darwin's and Haeckel's honour, with two other Germans whose photographs appeared in the album, Otto Caspari and Gustav Jäger. Krause wrote an essay on Darwin's grandfather, Erasmus Darwin, which Darwin had translated into English to use as part of a biography of his famous relative. More contributors to the album became correspondents of Darwin after it had been produced, including the German geologist, Melchior Neumayr, and the Austrian physiological botanist, Julius Wiesner. Gries, Brunhild. 2006. 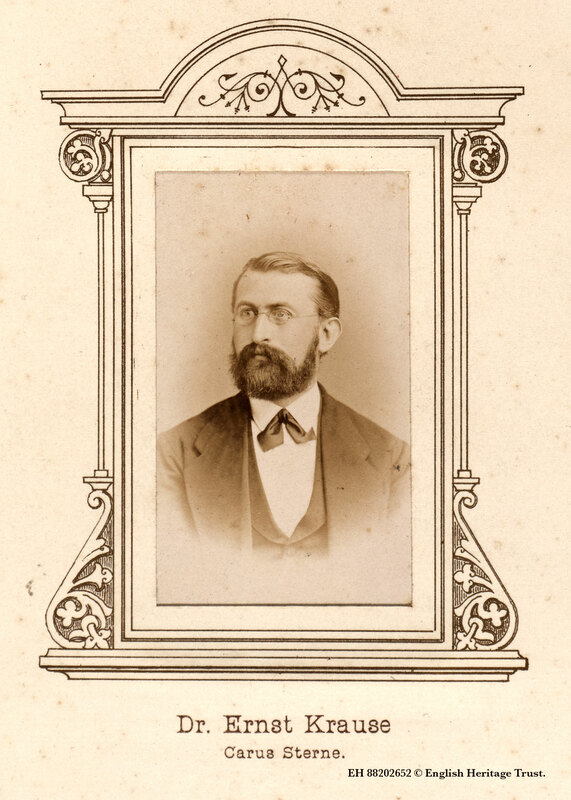 Emil Rade (1832–1931), sein Anteil an der naturkundlichen Erforschung Westfalens und das Darwin-Album von 1877.Abhandlungen aus dem Westfälischen Museum für Naturkunde68 (2): 1–93. Thanks EH for album of photographs of German scientists. Congratulates CD on testimonials from the savants of Germany and the Netherlands [Nature15 (1877): 356, 410–12] and generally on his contributions to biology. Asks if and when CD’s "Variability of organic beings in a state of nature", as projected in 1868 [seeVariation1: 4] is to appear. Explains why he did not add his photograph to the album presented by German naturalists to CD. Instead he wishes to dedicate to CD his work on the vertebrate-type eyes on the back of some Mollusca. [Enclosed is a MS introduction to this work,Über Sehorgane von Typus der Wirbelthieraugen auf dem Rücken von Schnecken.]. German science writer. Also published under the pseudonym Carus Sterne. Trained as an apothecary, and studied natural sciences at the University of Berlin in 1857. 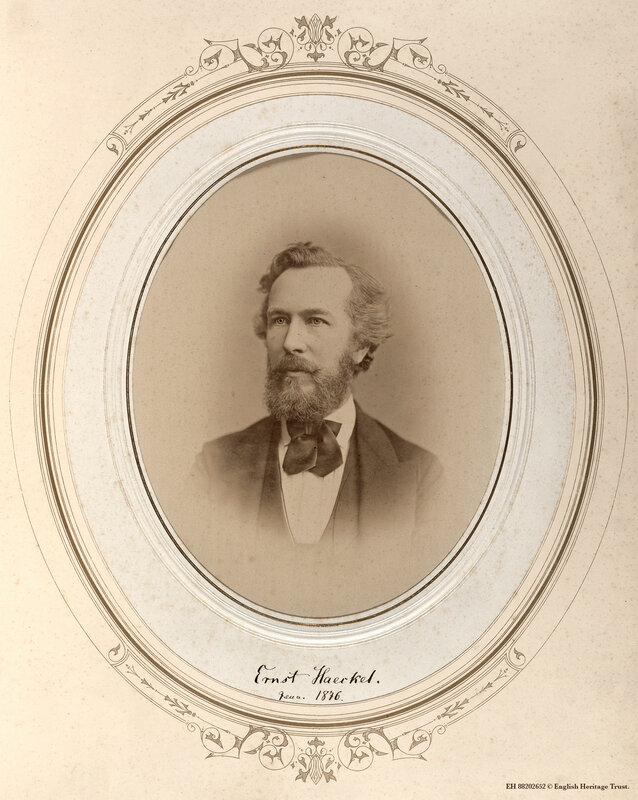 Friendly with Ernst Haeckel from 1866. Doctorate, University of Rostock, 1874. Editor of Kosmos, 1877–83. His essay on Erasmus Darwin (1731–1802) was translated into English in 1879 at the suggestion of CD, who wrote a biographical preface for it.